Wordless picture books are so much fun and you can certainly learn a lot from them. 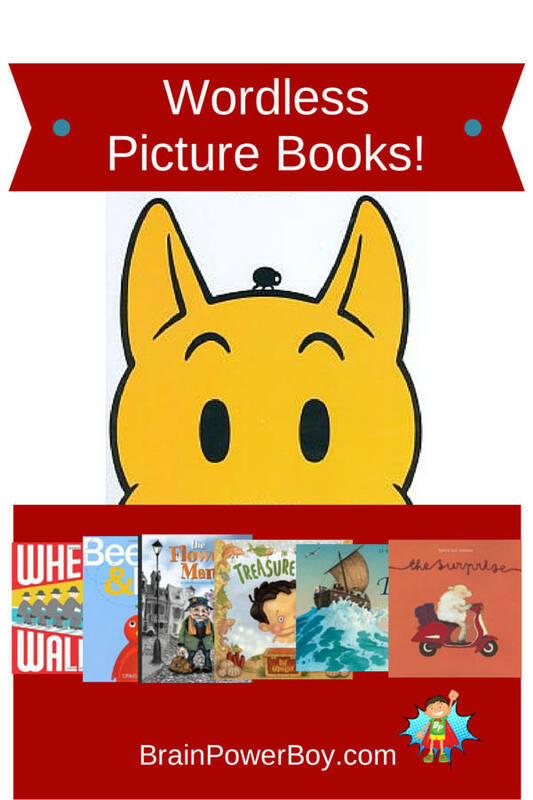 Take a look at our post on The Benefits of Wordless Picture Books for more information. These books have always had a special place in our household and I hope that you will find them enriching for your family. We make an effort to seek out new wordless picture books on a regular basis so I am happy to share the good ones with you. This round of books includes a few new ones that I had to go out and find. It is always fun to discover new books, isn’t it? We write about the best books for boys a lot on the site. It is all books, all the time, in our family 🙂 One of the things that I really love about wordless picture books are the illustrations. There are some real winners here. These range from silly, to delightful, to quite wonderful. I am sure you will find something here that your boy will enjoy. Where’s Walrus? by Stephen Savage is so much fun and I love the illustration style. Walrus isn’t all that happy in his little pool at the zoo. Find him, though he is not very hidden, in all of the pictures as the zookeeper tries to catch him. Gotta love the ending. Great! Bee & Bird by Craig Frazier is full of large vivid illustrations that young and old can enjoy. Pictures have a detail that lends itself to the next thing that is going to happen. It is super neat. If you are looking for something off the beaten path try Bow-Wow Bugs a Bug by Mark Newgarden and Megan Montague Cash. Bow-Wow is a dog (no surprise there) who is being bothered by a bug. A grand adventure through the neighborhood chasing a bug turns strangely interesting with a dalmatian loosing his spots and Big bugs as well. Sweet. That is the word for this one. The Surprise by Sylvia van Ommen is sweet. This book features a sheep who wants a special gift for a friend. Watch as the sheep goes through the paces to bring a friend a gift. Did I mention this is sweet? Ok, The Flower Man starts off dark. When I opened the book I wasn’t sure if I would like it. However, there was a tiny bit of light surrounding the man and I was intrigued. The illustrations are not really my style, but that being said, there is certainly a lot to look at and it is a fun book to flip through. Perhaps best for boys who are a bit older so they can grasp the significance of the book. Picture a sand castle and the waves coming up to meet it. Sea of Dreams by Denis Nolan is a fantistical adventure book that is sure to delight (and make you wonder!) Beautifully drawn. The Treasure Bath by Dan Andreasen introduces a little boy with a big imagination. Features a boy cooking which I like (see my post on Boys’ Learning in the Kitchen) Also, as you can tell from the title, there is a bath involved and undersea treasure as well. I think boys will like it, and if you make a cake together to enjoy at the end . . . all the better! and for more great books for boys click through the link. What are your boy’s favorite wordless picture books?